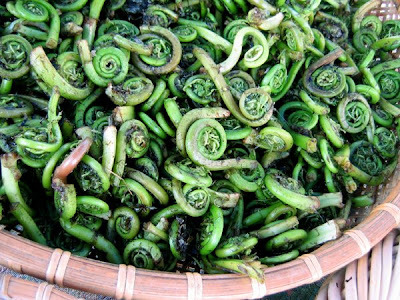 Good Stuff NW: In Season: Fiddleheads! I was introduced to this short-lived spring green by my in-laws, former farmers in the tiny town of Houlton, Maine, often known as the coldest place in the nation in winter. They were shocked (shocked!) that I'd never had the curly delicacy that tastes like a crunchy version of spinach and is found along most streams in that state. And we were both relieved when I asked for seconds. Norma Cravens of Springwater Farm near St. Helens gathers them on her property along with spring nettles and gorgeous maitake mushrooms. She sells her produce to several restaurants, including Nostrana, but you can find her at several of the Portland-area farmers' markets. Fiddleheads will only be around for another week or so, but if you hurry you can have these wild green treats before they're gone.